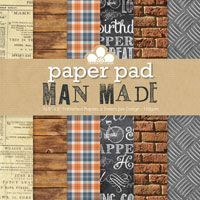 Fabulous masculine themed paper pad, containing 6 sheets each of 6 single sided designs. The designs include newsprint, tartan, wood planks, chalk board, bricks and metal grid, making it perfect for men's birthday and Fathers Day cards as well as many other uses. Size approx 20 x 20cm or 8 x 8 inches, 190gsm.